The Natural Horse Hair Interior Detail Brush is the interior detailing brush you’ve been searching for. 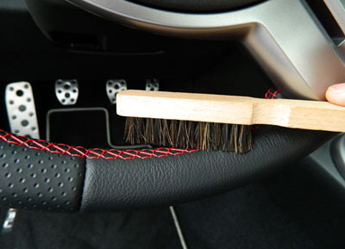 No longer will you have to accept leather that’s “clean enough” because this slim, soft, all natural brush cleans the nooks and crannies of your interior that are unreachable by other brushes. Featuring all-natural horse hair construction and a low-profile wooden handle, the Natural Horse Hair Interior Detail Brush is quite possibly the best interior detailing tool you’ll ever purchase. How clean is your leather? Surely you’ve spent a great amount of time cleaning the parts that the eye can see, but what about the nooks and crannies, that only someone with a keen eye would notice? More than likely you’ve attempted to clean in between the cracks and crevices, but how effective is your technique? A few quick sprays with your favorite leather cleaner and a couple seconds scrubbing with the Natural Horse Hair Interior Detail Brush will reveal how dirty your leather actually is! Don’t overlook the stitching! Most people tend to focus on big, flat swatches of leather that are quick and easy to clean. The brushes and applicators we use to clean such large sections are not intricate enough for the stitching. 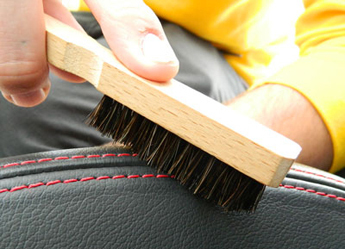 The Natural Horse Hair Interior Detail Brush and its slim design and feathered bristles is capable of gently removing built-up dirt and grime from your leather’s stitching without causing it to fray. 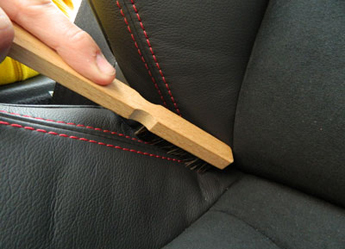 When cleaning leather, we recommend using Pinnacle Leather & Vinyl Cleaner with the Natural Horse Hair Interior Detail Brush. 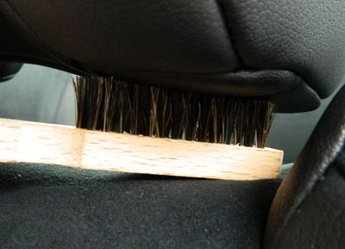 The natural horse hair bristles will work the cleaner into the leather’s pores, releasing dirt and foreign oils. Follow with Pinnacle Leather Conditioner to condition and protect the leather.